Hard candy can seem very intimidating to make. You’re dealing with hot temperatures, minute changes, and praying that the sugar hardens into the shape. But honestly, I was shocked by how easy it was to make your own lollipops. It’s basically a very light toffee, on a stick. As long as you let the syrup heat up to the right temperature, and pour it out into the molds immediately, you’ll be all good. 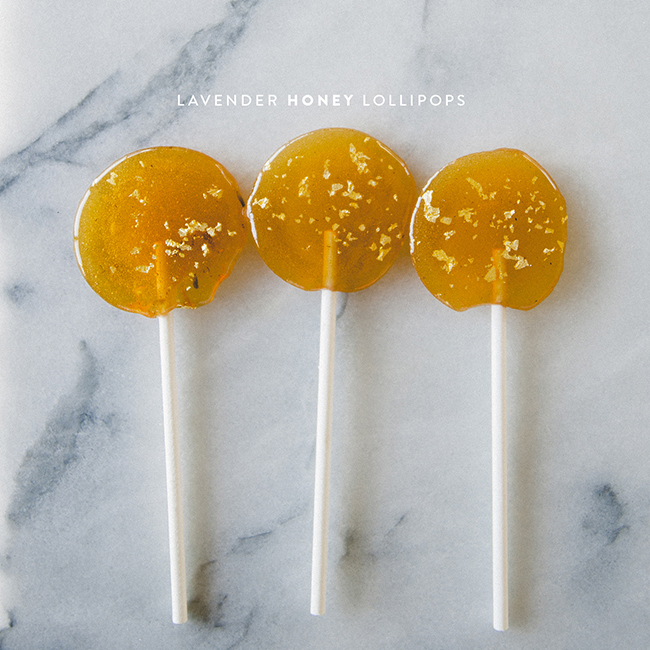 I love the combination of honey and lavender, so I went there first, but, feel free to mix in any other flavors you like. If you’re using ground spices of extract, add them at the very end, once the syrup is off heat. Enjoy! Line two large cookie sheets with parchment paper or Silpat baking mats. Or, fill a jelly roll pan with cornstarch, and using a shot glass, make indentations in the cornstarch (space the lollipops 3 to 4 inches apart to guarantee they don’t run into each other) and place the lollipop sticks in them. This method creates more defined lollipop shapes. Combine the sugar, honey, lavender and 1/4 cup water in a small saucepan set over medium heat. Attach the candy thermometer to the interior of the saucepan. Increase the heat to medium-high to bring the mix to a boil, stirring until the sugar has dissolved. Using a small pastry brush dipped in water, wash down the sides of the saucepan to prevent crystals from forming. Boil the mixture for 5 to 7 minutes until it reaches 310ºF (hard-crack stage) on the candy thermometer.